Need a new Beach Tent? From small Shelta popups to large QuickTop popup marquees you'll find one here. 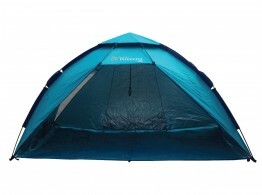 Here you’ll find our range of beach tents and folding marquees that are suitable for the beach. We specifically recommend our Aluminium pop-up marquees as suitable for beach activities because they will not rust, unlike steel models. If you’re thinking of a smaller pop-up tent for the beach then you should consider one of Shelta’s famous UV protector beach tents. These great beach tents just pop up in a flash and have a 50 UPF sun protection factor ensuring that you and your family are protected when you go to the beach. The Shelta Super UV Protector is absolutely the best protection from sun and wind on the beach for larger families. 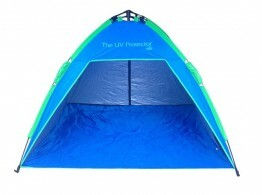 The UV PROTECTOR offers protection from sun and wind - perfect for the beach.